Nearly 300 apartments are proposed for an eight-acre industrial site used for years as a concrete company’s maintenance yard in midtown Omaha. 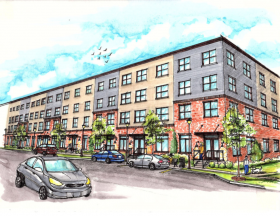 The $40 million Duke of Omaha project is billed as high-end living and is to be built east of 46th Street, stretching north from about Dodge Street to California Street. That’s a swath behind the row of Saddle Creek Road grocery and retail stores that include Panera Bread, Westlake Ace Hardware, Walmart and Schlotzsky’s.